We are considered as a legendary manufacturer of the cast bronze Y strainer, a strainer that is made from the cast and bronze material that is extremely demanded in the hot & cold potable water pipeline application. 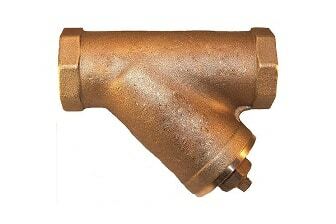 This cast bronze Y strainer is designed with uttermost attention towards dimensions in order to provide the range of the Y strainer that can perform flawlessly in its objective that is to strain sediments from the liquid, gas or steam flow stream and protect valuable process equipment from failing or prevent system closedown caused by jamming. This cast bronze Y strainer meets all the quality standards outlined by the ASME and also fulfills the API standard requirements and therefore is worth investment for removing impurities. No matter what type of flange you need to fit in your system, we as a cast bronze Y strainer manufacturer are specialize in our forte and can deliver best in class range for your needs. The offered cast bronze Y strainer available in stock is suitable for a variety of operational pressures ranging from 200 psi to 500 psi and has aptitude to withstand temperature up to 150 °F, which we can provide in India as well as other countries at the most competitive prices.